Simultaneously charge 20 iPads or iPad Mini's. Charging is done via multiple USB port charging station. The exterior of the charging station is waterproof and airtight, keeping iPads protected from rain and dust. Foam slots keep iPads in place and protect against any possible damage that usually could happen during impact and vibration. Interior lid offers lockable protection for when iPad are being charged. 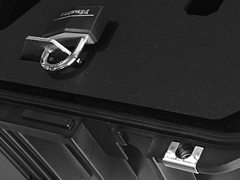 When being transported the exterior lid can be padlocked. When not in use iPad Charging Station can be used for storing iPads. Charging Station is ideal for school classrooms, businesses, tradeshows, and more. Transportation for multiple iPads is now an easy task, with a pull handle and wheels the USB iPad Charging Station can be wheeled from one location to the next, whether it be from one classroom to classroom, or at a conference. iPad is charged by plugging in USB to USB port. *USB cord not included. Foam padding protects iPads from damage and keeps iPads from moving around. Interior lid locks iPads in when charging and exterior lid keeps iPads secure during transport. Customize a caseCruzer Charging Station to fit your needs. iPad Charging Station charges up 10 iPad tablets. 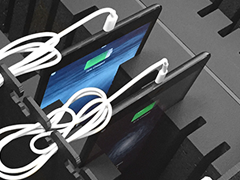 School iPad Charging Station holds 10 iPads and is perfect for classrooms and libraries. 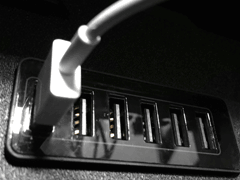 Laptop Charging Station charges eight laptops simultaneously. Charge up to eight Chromebooks inside theChromebook Charging Station.